At Walt Disney World Resort, we are constantly looking for new ways to deliver the best experience possible for our guests – from the moment they book their vacation through the very last attraction they visit in the theme parks. With all there is to see and do in our parks, we know guests are increasingly looking for easier ways to plan a vacation with personalized options that fit their individual needs. 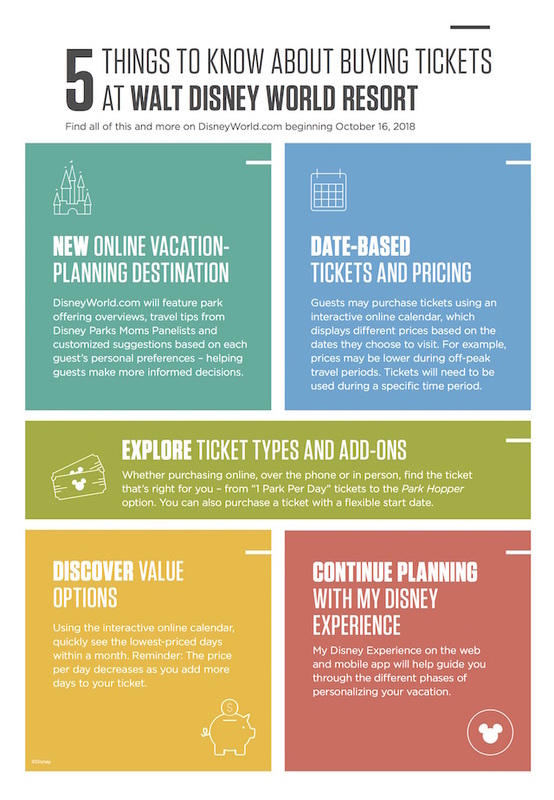 Beginning Oct. 16 on DisneyWorld.com, guests will be able to access our new online vacation-planning destination and purchase tickets priced by the date of visit. These changes are designed to simplify the booking experience, give guests an enhanced way to purchase theme park tickets and help them more easily plan the Disney vacation of their dreams. Check out the video below for a first look at how it works. Once tickets are purchased, guests will be able to continue seamlessly planning their vacation on the website through My Disney Experience, which guides guests through the different phases and steps of personalizing their vacation to make the most of their travel party’s unique interests. Guests can manage their plans through the My Disney Experience mobile app as well, where they will also be able to access the interactive calendar and purchase their tickets on the go. These updates are designed to help you plan your dream vacation – both now and for years to come. This is an incredibly exciting time at Walt Disney World Resort, which continues to grow and expand with industry-leading immersive lands like Pandora – The World of Avatar at Disney’s Animal Kingdom and Toy Story Land and Star Wars: Galaxy’s Edge at Disney’s Hollywood Studios. In addition to these groundbreaking expansions, guests will also have a chance to experience upcoming attractions that take creative storytelling to the next level from the recently announced “Ratatouille” and “Guardians of the Galaxy” attractions at Epcot to a Tron-themed attraction at Magic Kingdom Park, to the first Mickey Mouse-themed attraction with Mickey and Minnie’s Runaway Railway and so much more coming soon. Does this mean that if I wait to purchase my tickets until right before I book my fastpasses, that they will be super expensive because it’s Christmas week?